With a title like Preacher's Kid, it's not entirely unfair to walk into the film expecting a "standard" faith-centered/gospel play-style drama. 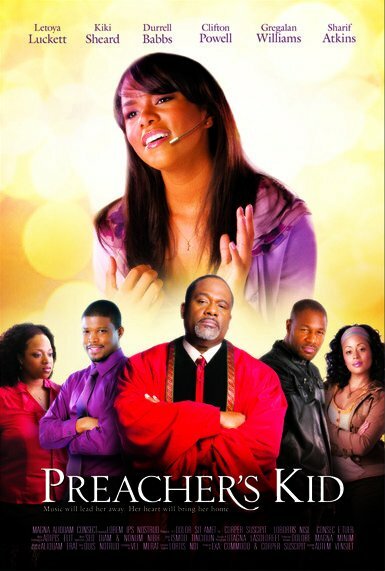 A plot summary makes expectations fall further in that line: sheltered 20-something choir girl Angie King (LeToya Luckett) leaves the home of her strict bishop father (GregAlan Williams) to join charming R&B star Devlin Mitchell (Durrell "Tank" Babbs) on a touring gospel play company. The story is another variation on the prodigal son tale, used many times over in entertainments both religious and secular. But the film's writer-director is Stan Foster, whose most recent screen credit was for the screenplay for one of the best, most affecting entries in the genre, 2004's Michael Schultz-directed, Independent Spirit Award-nominated adaptation of his play Woman Thou Art Loosed (based on the novel by Bishop T.D. Jakes), and accordingly there's a bit more edge and heft than just the expected faith-affirming messages and lessons. Most striking of all Foster's self-referential, meta-commentary approach with the film's play-within-a-film conceit. While this angle allows Foster to poke some good-natured fun at the well-worn tropes of genre, both in on-stage action (e.g. broad character types in both old age and Madea-style cross-gender drag; the obligatory moment of gratuitous beefcake by the heartthrob lead) and more inside issues (such as the types of stars generally cast in such productions and the general day-to-day working conditions of such touring plays), it also reinforces how he employs those familiar genre conventions far more effectively than the norm. Indeed, at the core of the film is a well-meaning female lead caught between a Very Bad Guy in Devlin and a Very Good Guy (choir director Wynton, a bit of a thin role played by Sharif Atkins), but there's a fair amount of grey shading that makes the proceedings all the more believable. While his behavior comes to explicitly live up to his similarly-sounding namesake, Devlin's effortlessly charismatic manner is convincingly, understandably alluring--and hence all the more insidious as he preys upon Angie's naivete and attendant insecurities. Those qualities in Angie are nicely drawn from the start, and as such her more questionable decisions are understandable, coming from that place of honest unworldliness and a pure need to be accepted and belong in the "real" world outside of her father's orbit; accordingly, she is also is shown to not be beyond displaying some unpleasant behavior herself. The added complexity is also present in the smaller parts, from the play's pragmatic director Ike (Clifton Powell), who does his part in advising caution but knows better than to not say or do anything to upset the rather delicate production in any way; to Angie's father, who may be wise to warn about the evils of the world but must also learn himself--not only to let go but also, in an effective (if somewhat underserviced, due to run time constraints) secondary plot, to start living life for himself a bit. That sense of balance and subverting expectations extends to the casting. While veterans such as Powell, Williams, and Ella Joyce (as an old friend of the bishop's) reliably do the job in their supporting parts, carrying the film--as is often the case in many of its stage-based ilk--are two familiar figures in the R&B world who are relative newcomers to acting, Luckett and Babbs. Luckett proves to a natural beyond her established vocal abilities, comfortably navigating the emotional demands of the role and holding the screen with effortless, relatable likability. Any outward signs of Luckett's screen inexperience actually serve the part well, for Angie would be a bit ill at ease in many of the situations in which she suddenly finds herself and especially when confronted with as overwhelming a presence as Babbs's Devlin. Babbs doesn't seem to be stretching much at all in the early stages, clearly having fun riffing off of his well-known loverman music persona, but what really makes Devlin's eventual manipulations and abuses all the more startling is just how convincing Babbs proves to be in depicting the dark side. Likely to be underrated in a less showy but no less important part is Tammy Townsend, who shines both vocally and dramatically as Desiree, Angie's rival for Devlin's leading lady position both on and off the stage. She, like the rest of the cast, benefits from Foster's generosity in his script, taking what in another film could be a cardboard adversary into a character that develops unexpected layers as the film progresses. While that sense of added dimension strengthens Preacher's Kid throughout, the ultimate reason for its success lies in something simpler, which is actually addressed in one rather observant line from the film: "Our audience may not be the most sophisticated, but they can spot a lie." In terms of broad narrative and thematic strokes, the film may not venture too far past what is plainly obvious from the outset. So it all comes down to how the formula is executed and how the message is expressed during its two hours, and Foster's film confirms the unique, undeniable power this genre can achieve on both stage and film--best exemplified by a scene climactic to both the movie and the play-within-a-movie, where Angie's song soars with such sincere, soul-baring passion that the audience, religious or otherwise, is uplifted beyond the screen and to a place that is genuinely transcendent.